Back in May 2018, Tyler Schultz sent a tweet to Insomniac Games, the studio behind Marvel’s Spider-Man, with a request. He wanted to propose to his girlfriend in the video game. After a short back and forth, Insomniac Games’s Twitter account went for it. As the account tweeted, “Well ok then, who are we to say no to love?” And, indeed, it does seem like Spider-Man would be the exact superhero to help make this kind of thing happen. 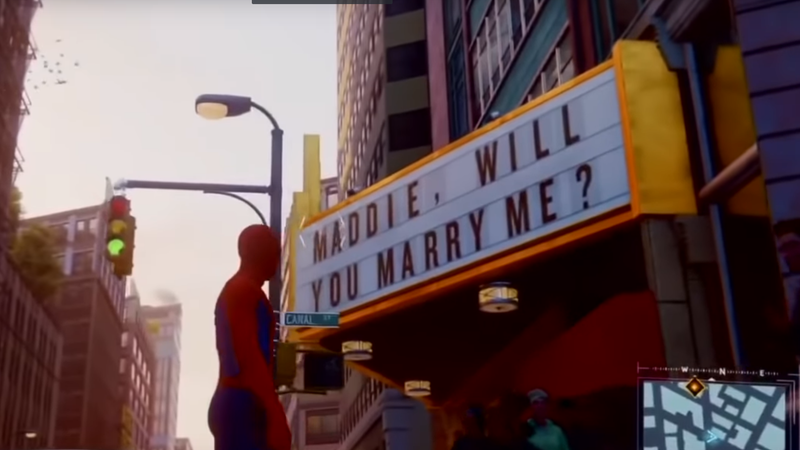 The game released last week, and the easter egg of “Maddie, will you marry me?” is in the game on a theater marquee. However, there’s a problem: Schultz and his girlfriend broke up before the game’s release, both have told Kotaku. If you go to this intersection you can find the easter egg. The story doesn’t stop there, though. Jacinda Chew, whose job title is Art Director at Insomniac, tweeted an offer to change the sign in a patch since things didn’t work out for the relationship in the end. Schultz initially tweeted that he didn’t want to change the sign, but then followed up that he had an idea for what the change could be. Schultz told Kotaku that he wants to replace the wedding proposal with the name of his grandmother, who has passed from cancer and helped ignite Schultz’s passion for Spider-Man. She gave him his first Spider-Man comic book as well as a copy of Amazing Fantasy #15, the first appearance of the character. It’s a natural part of life for romantic relationships to begin and end. Not even Spider-Man can alter the pathways of the human heart, and I hope that both Schultz and his former girlfriend go on to lead happy lives. Kotaku reached out to Insomniac Games for this story but did not hear back before publication. In subsequent conversations with Kotaku, both acknowledged relationship struggles, including fights and arguments. Maddie discussed the failure of the relationship and lamented the “drama” that was coming from this proposal getting further publicity and for her being viewed as the bad guy. “I don’t want to hurt him,” she said, while also noting that she’d been harassed and threatened on social media. “It’s just ridiculous,” she said.